FILE - Zimbabwean President Emmerson Mnangagwa shakes hands with Chinese Premier Li Keqiang before their meeting at the Great Hall of the People in Beijing, China, April 4, 2018. Much of the recent, heated debate surrounding Zimbabwe's coming elections centers on the nation's largest foreign investor, China — and analysts say the conversation is distracting from the real election issue: Zimbabwe's failing economy. Zimbabwean President Emmerson Mnangagwa is courting both China and the West, saying that Zimbabwe, after decades of pariah status, is "open for business." But Nelson Chamisa, leader of the opposition Movement for Democratic Change, has pledged to weed out Chinese investors whom he accuses of exploiting Zimbabwe. He accused Mnangagwa, whose nickname is Ngwenya, or Crocodile, of being involved. FILE - In this March 8, 2018 photo, the leader of MDC-T, Zimbabwe's biggest opposition party, Nelson Chamisa gestures during an interview with the Associated Press in Harare. “We do just say Zimbabwe is open for business when we see that the business you are talking about, is looting, your business is corruption, your business is marginalization of the workers, your business is shady dealing,” he said at a rally in Harare this week, speaking in a mixture of English and Shona. The opposition is attempting to unseat the ruling ZANU-PF party, which has ruled since independence in 1980. 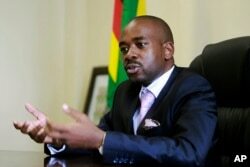 Chamisa has mocked Mnangagwa’s claim that Zimbabwe is “open for business,” saying that the nation needs to be choosier and only allow deals that “truly benefit the people” — not just elites and wealthy investors. Zimbabwe has faced tough U.S. and international sanctions for alleged human rights abuses and political repression under former president Robert Mugabe. One of the few sources of foreign investment has been China, which has pumped money into mining, chemicals and textile projects. China-Africa analyst Cobus van Staden, of the South African Institute of International Affairs, says he’s not surprised to see China becoming a political football. Mnangagwa has made clear overtures to China since he came into power in November after the military-supported resignation of President Robert Mugabe. 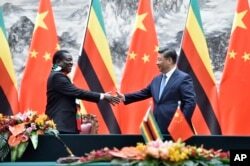 His first presidential visit outside of Africa was to China, where, in April, he and President Xi Jinping spoke of a “new chapter” between the two countries and of deals that would rejuvenate Zimbabwe’s economy. FILE - Zimbabwean President Emmerson Mnangagwa, left, shakes hands with Chinese President Xi Jinping as they pose for the media after a signing ceremony at the Great Hall of the People in Beijing, China, April 3, 2018. Derek Matyszak, a Harare-based political analyst from the Institute for Security Studies, says that for all that talk, he’s not convinced that the foreign direct investment has actually happened. 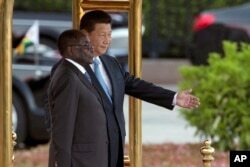 And, he says, the Mugabe administration’s poor record of China-Zimbabwe joint ventures means that, while Zimbabwe may be open for Chinese investment, China may not be so sure. FILE - In this file photo taken on Aug. 25, 2014, Chinese President Xi Jinping, right, shows then-Zimbabwe's President Robert Mugabe the way during a welcome ceremony outside the Great Hall of the People in Beijing, China. Sebastian Mhofu contributed to this report from Harare.